If there is cachet in having an entrance even the average Mensa candidate can’t find, the new Dovetail has it. But try to find that door. It leads to deliciously complex food by chef-owner John Fraser doled out by scrupulously trained servers, a too rare combination these days, where irrepressible rappers and attention deficit waiters are the rule. Our designated caretaker, with his elegant operatic beard, looks like he’s dressed for a benefit in the Hamptons in perfectly pressed cotton that fits like a dinner jacket. I’m sure some will admire architect Richard Bloch’s restrained design. A beauty editor-type assures me that the light I find sadly dim is, in fact, “romantic and flattering.” Indeed, the entrance and bar are spiffy, but bare walls and somber neutrals in the stripped-down dining room cry out for art or flowers. Happily, even at that earliest first dinner, the kitchen has perfected its mojo. Clam chowder polka-dotted with smoked potatoes, peppers and chorizo, daringly creamy, comes with a buttery mini-croissant baked in-house. The inevitable pork belly is both crisp and rich, with flutters of kale and a modish egg on top. Potato gnocchi with veal short rib flaunts its foie gras butter. 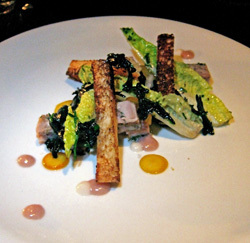 And lamb’s tongue is layered with olives and capers in a kind of miniature pressed muffaletta. I liked or loved almost everything I tasted in two visits. 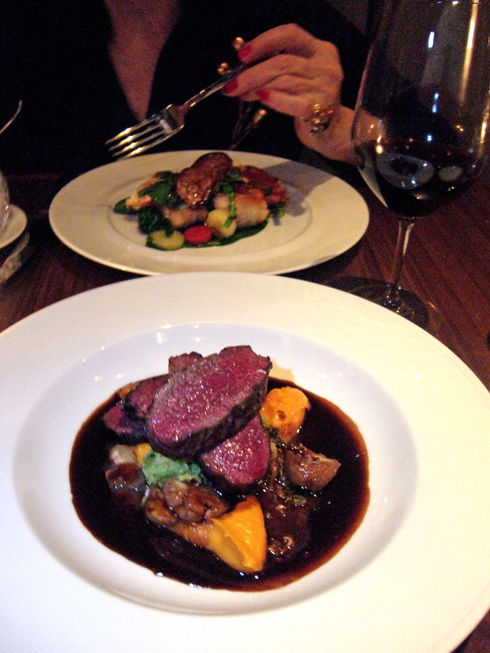 Carefully cooked monkfish with broccoli rabe under a large cut of seared foie gras, and the really rare grilled venison with chestnuts and yams were especially good. Still, local penny pinchers like me, wary of weekday entrees that start at $27 and go to $34, with appetizers $12 to $16, will see Sunday’s $38 prix fixe as a definite lure. Choices include most of the weekday offerings, the gnocchi and lamb’s tongue, a salad of brussel sprout leaves tossed with pears and Serrano ham and cauliflower, exquisite sea scallops with blood orange and hollandaise, and the crusty lamb shank with polenta and chestnuts. Not that riding the discount is without bumps. 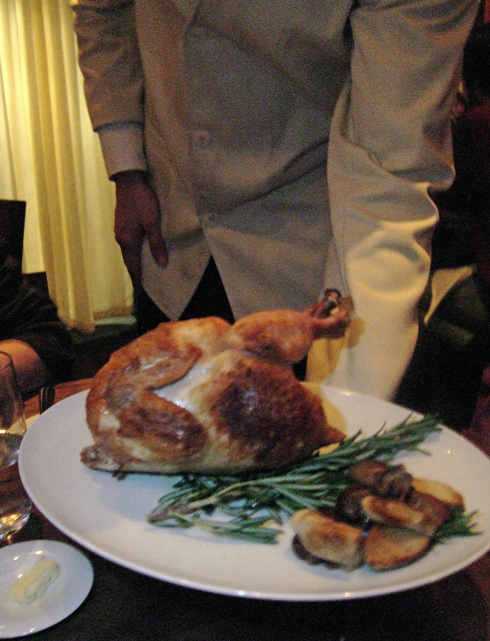 My friend Vicki and I, sharing Sunday’s picture-perfect whole roasted chicken presented at table so we can cluck over it before being returned to the kitchen for carving, slip into paranoia when the manicured bird returns missing some parts. “Where is the rest of the chicken?” she asks. Our waiter recoils as if accused of kidnapping. “There’s only one leg and one thigh between our two plates,” we complain. In carving that bird as delicately as if it were for Queen Elizabeth, both dark meat and wings with much white meat attached have vanished. After a longish wait, two saucers of the wandering bird hit the table. Perhaps the chef thinks wings are unseemly, food for savages. Style is not edible, alas. A slice of excellent rabbit terrine cut into three thin fingers to match three fingers of toast pointing toward the ceiling in a Tony Duquette jewelry design seems meager and carrot cake lacks cake, though not designer detail. But pastry chef Vera Tong’s blood orange and grapefruit tart with quark cheese chibouste and Compari is as much lush substance as style and her fabulous brioche bread and butter pudding sets off dueling forks (I would probably have made a federal case if I’d realized that was bacon brittle). Stop by any day at 5 for tea and a reprise of Tong’s sweets, her rectangular cheese muffins or that croissant. It may remind you of croissants past at the Four Seasons…if you’re old enough to remember and not so old you can’t remember.